Source: Produced in E. coli. 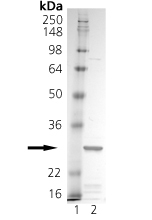 The extracellular domain of human TRAIL (aa 95-281) is fused at the N-terminus to a linker peptide (8 aa) and a FLAG®-tag. Specificity: Binds to human and mouse TRAIL receptors and human osteoprotegerin (OPG). Biological Activity: Induces apoptosis if applied with the cross-linking enhancer (Prod. No. ALX-804-034); see also TRAIL, Soluble (human) (recombinant) Set (Prod. No. ALX-850-018). Note: rhsTRAIL does not significantly induce apoptosis in the absence of an enhancer. Application Notes: ELISA: binds to human TRAIL receptors and human osteoprotegerin (OPG) at 10-100 ng/ml. Technical Info/Product Notes: Historical data has shown that Fas induces apoptosis in a concentration range of 1-100ng/ml if applied with the cross-linking enhancer (Prod. No. ALX-804-034). SDS PAGE Analysis: Lane 1: MW Marker, Lane 2: 1μg TRAIL.